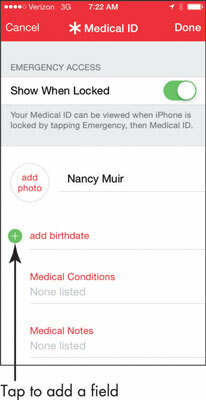 One of the simplest and easiest to use features on the iPhone 6 Health app is Medical ID, where you can store your vital statistics. This could be useful if you’re in an accident and emergency medical personnel need to access information about your blood type or allergies to medications, for example. 1In the Health app, tap the Medical ID tab in the lower-right corner. You see an introduction to Medical ID. 3In the screen that appears, for items with a + sign surrounded by a green circle, tap the Add button to add a field. You will see several options. 4For example, you might scroll down and tap Birthdate. When the screen appears, use the scrolling columns that appear at the bottom of the screen to set a birth date. For example, use your finger to scroll up and down on the month field till you find your birth month; then do the same thing to the day and year columns until your birth date is set. 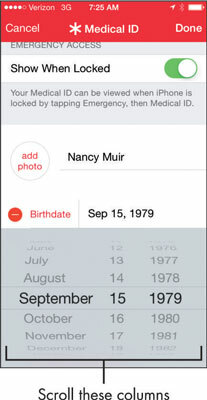 5Tap a field such as Medical Conditions to enter information using the onscreen keyboard that appears. 6Tap Done to save your entries. Your entries will be saved. 7Tap Edit to add more fields or edit existing fields. On the Medical ID screen of Health is a note saying that if you choose to set the Show When Locked switch to On, emergency medical information will be available on the Lock screen.